Why do we gain weight ? The unique teaching methodology of New Age Yoga is designed to offer body sculpting, mind management as well as peace and harmony of the soul. Sandhya Patki, the prinicipal trainer to more than 12000 people over more than 20 years, has fused Classical Yoga, Pilates and modern adaptations of Yoga to synthesize an effective result-oriented program to work on the body and mind. 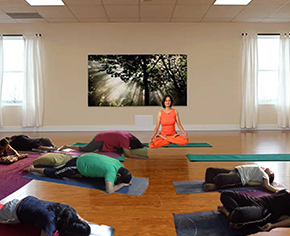 Principal Sandhya Patki, is a QCI-AYUSH certified Yoga Teacher. AYUSH- Govt of India has appointed the Quality Council of India to certify Yoga Teachers on the basis of their Yoga knowledge and teaching skills. Sandhya is a certified Yoga Teacher from the first batch of 8 such teachers all over India. Sandhya Patki is a registered RYT 500 teacher from Yoga Alliance, US. New Age Yoga Institute Teachers Growing team..
© 2013 yogasandhya.com. All Rights Reserved.